For over a year anticipation has been building for the upcoming Disney live action film, “Beauty and the Beast,” starring Harry Potter alum Emma Watson as the beloved Belle and Downton Abbey heartthrob Dan Stevens as the gentle Beast. It arrives in theaters next week on March 17, but the first trailer debuted on May 23, 2016. It has reached over 21 million views on YouTube and succeeded at overwhelming the hearts of Disney movie lovers all over. The Walt Disney Company, of course, has taken advantage of their built-in audience, releasing themed merchandise from tea set replicas to Belle-inspired books. Even Disneyland has transformed Fantasyland to the provincial French town where the story unfolds and altered the main restaurant into the Red Rose Taverne, where theme park visitors can finally discover if the grey stuff truly is delicious. With all this build-up surrounding the film, it is hard to not take part in its nostalgic appeal. However, this is only one installment in the recently developed series of live-action remakes from Disney. It all started with the retelling of “Alice in Wonderland” in 2010 with director Tim Burton and his favorite star, Johnny Depp, as the Mad Hatter. Its release led to a surprising revenue of $1.02 billion worldwide. Witnessing how successful the movie was, Disney decided to continue reviving their vault of old cartoons into a world of visual effects that could transform the hand drawn characters into life-like possibilities on screen. Following “Alice in Wonderland,” Disney went on to recreate “Cinderella” (2015) and most recently, “The Jungle Book” (2016). Not only were these stories brought to life with special effects and creative casting, but each plot came with a twist. This upturning of traditional fairytales is best captured in the untold story of “Maleficent,” brought to the big screen in 2014, magically portrayed by Angelina Jolie. Not only were audiences introduced to the childhood and backstory of the Sleeping Beauty villain, but the story turned the audience against the overprotective father of Aurora. In the end, true love’s kiss, destined to break the spell, came from an unexpected place to save the cursed princess. The movie made a total of $758.4 million, earning its place in the newly remodeled vision of Disney movies. A whole new world of possibilities has opened up for Disney’s movie industry with this kind of fresh take. Creating these movies for a broader modern audience has motivated each filmmaking crew to strive for newer and better methods of recreating old friends. For family entertainment, these remakes are able to go beyond the animated images and delve deeper into the story. With “Maleficent,” the darker side of the villain’s story allows adults’ interest to be piqued alongside children’s curiosity. Updated technology also allows for Disney movies to reinvent themselves. For “The Jungle Book,” director Jon Favreau found inspiration in Walt Disney’s own innovative dreams. Bringing such realistic CGI animals to life within a colorful jungle was living up to Disney’s legacy, as he said in the Hollywood Reporter. Utilizing updated, more complex plotlines and the best technology the industry has to offer, these movies are constantly moving forward to not only entertain audiences but to represent a bigger picture. As for “Beauty and the Beast,” the story of a girl from a small town searching for something more is no longer sufficient. As one of the most active voices in feminism, Watson makes sure that Belle breaks away from the princess archetype. Alongside Belle’s independence and adventures, Disney recently announced that the character LeFou is, in fact, the very first openly gay character for the company. The movie also embraces its musical roots with original composer Alan Menken back and introducing three new songs. 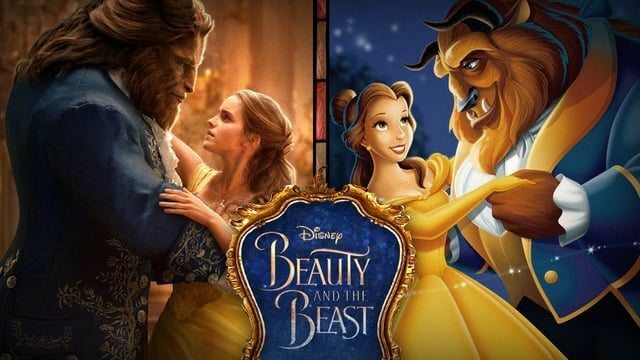 To keep up with its modern audiences, vocalists John Legend and Ariana Grande will sing the Grammy-winning classic tune, “Beauty and the Beast,” originally sung by Celine Dion and Peabo Bryson. This Disney evolution has garnered much attention from audiences around the world, and the company promises to continue making such films. News of future remakes are constantly being released, the most popular being “The Lion King,” “Mulan,” and “The Little Mermaid.” Recreating childhood favorites comes with its own set of risks, but with the movies’ new insights, higher production value, and well-known casts, the films continue to draw in audiences with content meant to provoke thought as well as be enjoyed.